When using a Gravity Form add-on like Survey or PayPal have you noticed how those form-specific add-on settings aren’t super glued to your form? What we mean by that is if you duplicate your form the add-on form settings aren’t duplicated with it. The same goes for when you export your form and then import it on another WordPress site. None of the add-on configuration is imported with the form. We feel this behaviour is counter-intuitive, and we didn’t want to force our users to redo all their PDF configuration if a form was duplicated or exported. We strongly believed the PDF configuration settings should function like confirmations and notifications, so much so that we built our own form settings CRUD interface to do just that. In layman’s terms this means Gravity PDF form settings are like super glue. If you duplicate a form any PDF settings will be duplicated. If you export a form and then import it the PDF settings will be included. 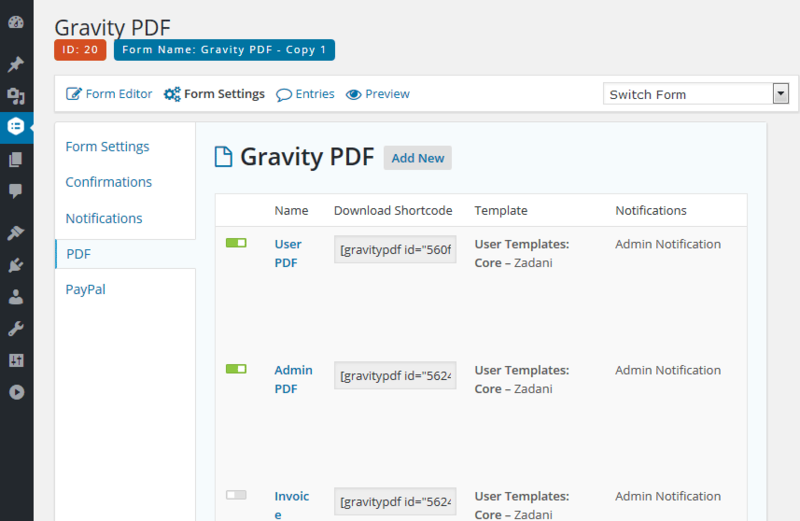 Enjoy Gravity PDF’s enhanced user experience!